This recipe for Roasted Spiced Carrot Purée is delicious with our Spelt Flat Bread recipe, which makes a great snack or appetizer. Also use as a dip for pita chips. Top with crumbled feta cheese, coarsely chopped pistachio nuts and a drizzle of cilantro oil. The spices, cumin, oregano, coriander, turmeric, smoked paprika and cayenne, each contribute to the overall depth of flavor and complement the sweet carrots nicely. 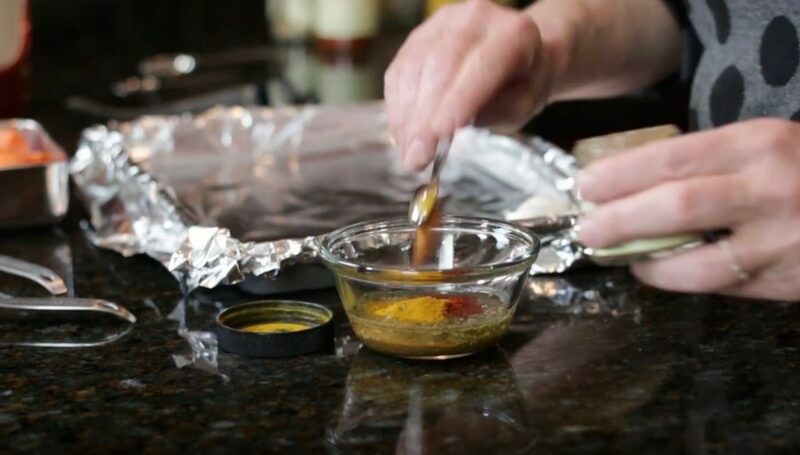 Preheat the oven to 400 degrees F and line a half sheet (13-inch by 18-inch by 1-inch) tray with foil or parchment paper. Coarsely chop up the carrots and lay on the prepared tray with the cloves of garlic. Combine the melted coconut oil, cumin, oregano, coriander, salt, turmeric, smoked paprika and cayenne and drizzle over the carrots. Use your hands to coat thoroughly. Pop into the oven and roast for 50 minutes. The carrots should be very tender. Cool slightly before puréeing in a food processor. The texture should be similar to peanut butter. Note: Avoid the blender – there’s not enough liquid to blend smoothly. For the flatbread, spread the carrot purée over the flat bread and garnish with cilantro oil, chopped pistachios and crumbled feta cheese. 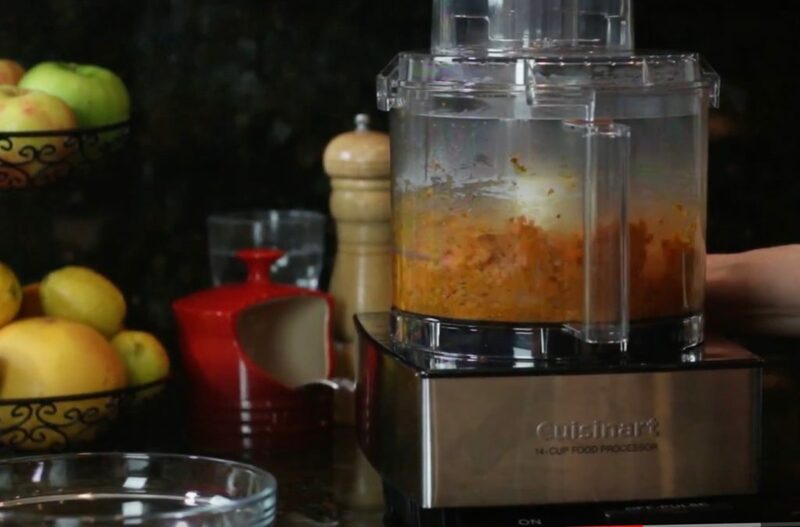 Watch the Roasted Spiced Carrot Purée here. A delicious carrot purée that’s wonderful spread on flatbreads or as an appetizer dip with pita chips. Stir the cumin, oregano, coriander, salt, turmeric, smoked paprika and cayenne into the melted coconut oil. 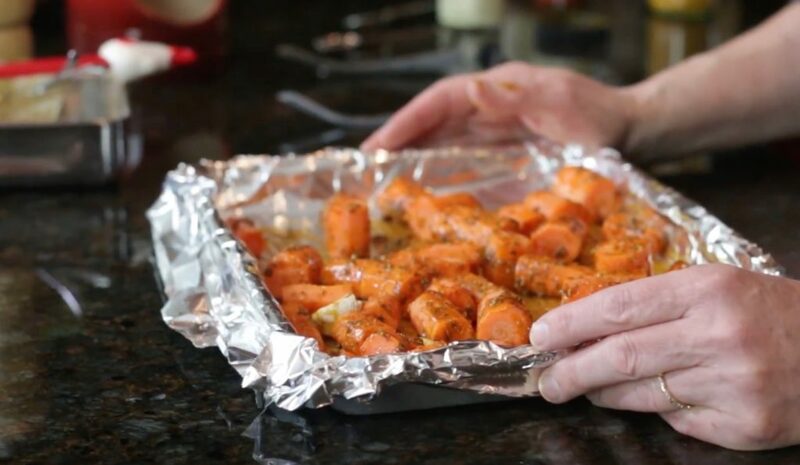 Place the carrots and garlic on a baking sheet, pour the spice mix over, and toss to coat well. Place in the preheated oven and bake 50 minutes or until fork tender; timing varies according to thickness of carrots. Cool slightly and purée to a paste, similar in texture to peanut butter. Serve as a dip or spread on flatbread. 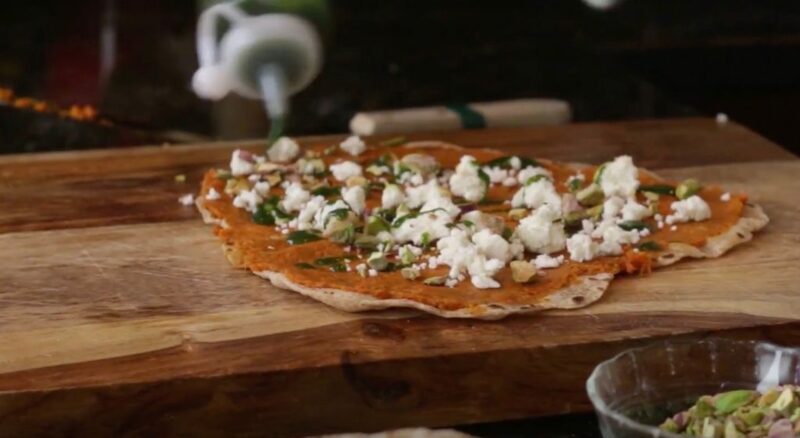 Makes 3 flatbreads: use 1/3 cup carrot purée, 1/3 cup crumbled feta cheese, 1/3 cup coarsely chopped pistachio nuts and drizzle each with cilantro oil. Cut into 6 or 8 squares or triangles. Years ago, easily 20 years ago, my husband and I toured the Geneva Lake area vineyards. In those days, the wineries weren’t as sophisticated as they are today and restaurants were minimal. One day we opted to have lunch at a local brewery. They specialized in pizza using fermented grains from making beer for the pizza dough. I was totally blown away by the spelt pizza. It was nutty, satisfying and obviously memorable. This inspired my recipe for Spelt Flatbread, which uses a combination of white whole wheat flour and spelt. I like these flours because of their unrefined properties and nutty flavors. White whole wheat flour is a soft wheat that has all the properties of regular whole wheat flour — flavor, fiber and nutrients, but maintains a less dense texture similar to white all-purpose flour. The all-purpose flour is easily replaced with white whole wheat flour without any change in flavor or texture. Spelt is known as an ancient grain, a staple used from the Bronze Age to medieval times. It is a winter wheat and therefore contains gluten, is high in fiber and contains zinc and iron. Most upscale grocers carry it and amazon.com is a great resource. If you can’t find or don’t want to use spelt flour, substitute regular whole wheat flour, which also provides great taste and texture. This flatbread recipe is thin and soft; cut like a pizza or roll out in a rectangle and cut into squares. It’s also great to use as a wrap. 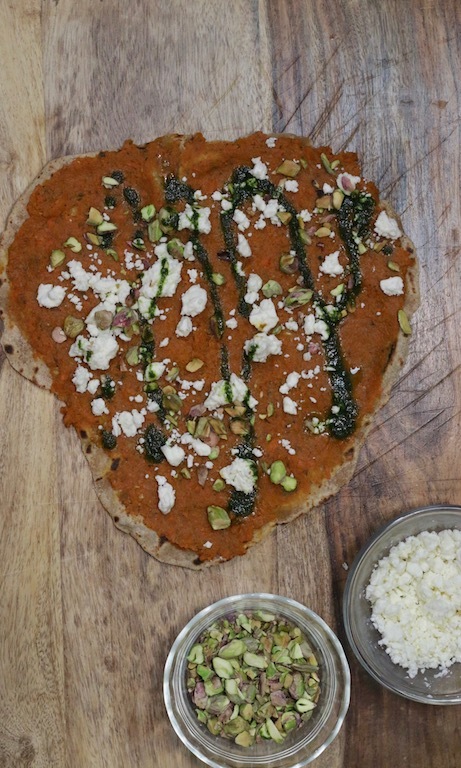 Try our Roasted Spiced Carrot Purée and Cilantro Oil on the flatbread with crumbled feta cheese and coarsely chopped pistachios as shown above. Watch the Spelt Bread Video Here. Try this quick and easy spelt flatbread recipe. It’s made with both spelt and white whole wheat flour, rich in fiber and flavor. Good for wraps too. Place the wheat and spelt flours and salt in a mixing bowl, blend to combine. Add the milk, yogurt and coconut oil; set the speed to low to prevent the flour from spraying all over and mix the ingredients. Scrape the sides of the bowl as needed. Once the ingredients are combined, raise the speed to medium for 15 seconds. The dough should not stick to the bowl and release easily. Divide the dough into eights (about 3 ounces each) and form into balls. Wrap each in plastic wrap and let sit at room temperature for 30 minutes. Dust your work surface and rolling pin with a little flour. Place one dough ball in the center of the dusting flour and sprinkle a little flour over the top to keep the rolling pin from sticking to the dough. Roll into a 10-inch round, very thin. Preheat a 10-inch skillet over high heat. When the pan is not, lay one flatbread on the pan (no oil needed) and cook until large bubbles form. Flip and cook for another 30-40 seconds. The bubbles on both sides should be dark brown. Set aside and repeat with the remaining flatbreads. The flatbreads can be stacked without sticking. Most upscale grocers sell spelt; Amazon.com is a great resource. Superbowl Sunday is upon us, and while I’m not a fan, my husband is a fanatic (unfortunately for him, he’s a Jets fan). Some buddies are coming over for the game and, of course, I’m cooking. This year I’m making Italian sausage and broccoli rabe calzones with a marinara sauce on the side as the main course. My favorite pizza dough recipe is from Anne Burrell; you’ll need to double the recipe to get the 24 ounces needed for this recipe. Don’t hesitate to purchase your dough from the store or your favorite pizzeria. 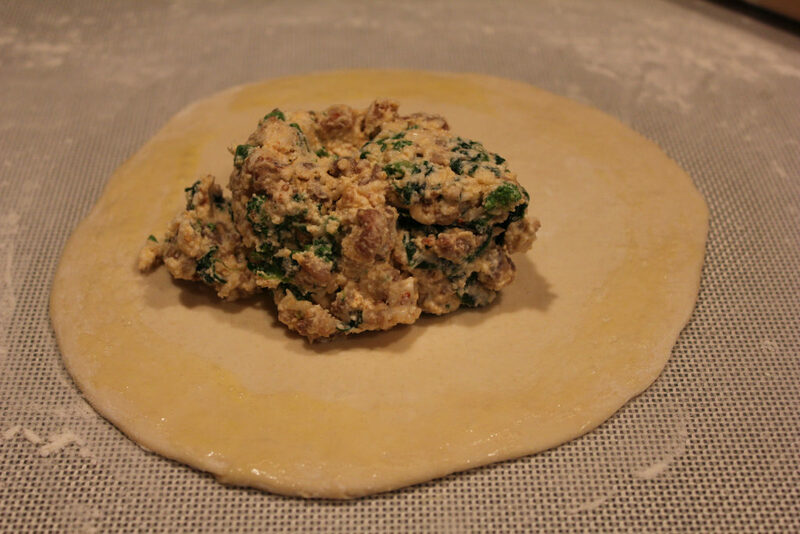 Tasty pizza dough stuffed with both spicy and sweet Italian sausages, broccoli rabe and three cheeses. Serve with marinara sauce on the side for dipping. Combine the egg, ricotta, mozzarella and Parmesan cheeses in a large bowl. Stir in the sausage and broccoli rabe. Season as needed with salt and pepper. Roll out 4 ounces of dough to an 8-inch round. Brush the edges with beaten egg. Place 1/2 cup of the filling in the lower half of the circle. Fold over and crimp the edges. Press the filling down a little to spread within. Place on a parchment lined sheet tray sprinkled with cornmeal. Brush the tops with beaten egg and bake in the preheated oven for 30-35 minutes, until golden brown. Serve with a marinara sauce on the side for dipping. Note: Taste the mixture first before adding salt. The saltiness of the cheese and sausages varies.